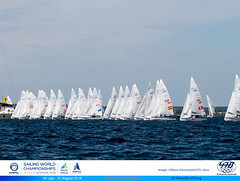 The qualifying series has concluded today with the scheduled six races sailed at the 470 Junior World Championships for men/mixed and women. Three races took place today, and Sofian BOUVET and Jeremie MION from France take over the lead in the men’s 470, whilst Tara PACHECO and Berta BETANZOS (ESP) maintain their leading position from yesterday. Sofian BOUVET and Jeremie MION end the qualifying series in overall leading position, after scoring a series of 1, 2, 3 in today’s races. Yesterday’s overnight leaders Luca DUBBİNİ and Roberto DUBBİNİ (ITA) had problems with today’s light conditions and took a 14th position in race six, today’s last race, as a discard. “There was a light and shifty wind today of maybe about 5 to 6 knots. We did not do so good as yesterday, especially in the last race. We went to the left side of the course, but the right side was favourable. We hope for heavier conditions with more wind during the finals. We’ll see what happens.” the DUBBINI cousins said. 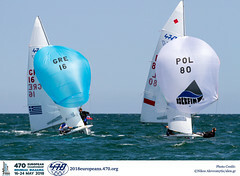 These hopes are shared by more sailors, like Mitja MİKULİN and Sebastian PRİNCİC(SLO), who started today’s races in second overall, on equal 10 points with the Italians. “We had very light winds today, and we made bad starts. We hope for some strong wind tomorrow.“ MİKULİN said. The Spanish team who have one goal here, to claim the Junior World Championships title, had a mission today to maintain their overnight lead and score some consistent results, which they managed with apparent ease. 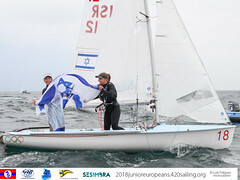 Gil COHEN and Dana MAMREIV (ISR) are close on their back with a six points difference, however the Israelis have already used their discard after a disqualification in yesterday’s second race. “The first two races of today went very well; two times third. The last race was very difficult. We didn’t manage to get into the top ten on the first leg and we had to work very hard. We did really well on the reach but we knew that we had to do even better on the last downwind leg to have a good result. Finally we finished fifth, so it could have been worse.” the Spanish crew BETANZOS said. Tina LUTZand Susann BEUCKE (GER), who seemed to be in top form in yesterday’s heavier conditions, spent the day in the middle of the crowd, giving Annika BOCHMANN and Anika LORENZ (GER) the opportunity to climb above them with only a one point margin. Germany dominates in this event with three crews in the top five.